Isn’t technology changing everything around us? Yes, it does, and cameras are no different. Not a long time ago, cameras weren’t considered a good option for fast moving images, especially for outdoor sports. However, as the technology got better, a newer version of cameras stormed the markets and has now become the most popular type of cameras known as sports cameras or action cameras. Sports cameras allow you to take pictures without distorting your image even when you are moving fast. This is something that was not possible before action cameras. With action cameras, you can take pictures and videos while driving, riding a motorcycle, boating, racing, and while taking part in any adventure sports in the air, land, or underwater. For these reasons, action cameras are now considered the most popular cameras on the market, with huge demand. However, it also comes with its own dilemma. Since there are so many brands and models to meet very high demands, it is quite impossible for an ordinary person to compare all and choose the best one. In the article, we have reviewed one of the most popular action cameras, the EZVIZ S2 Elite 1080p 60fps action camera. Let’s look into what features it offers and why this makes a good option for you compared to others. Even though EZVIZ is not as popular as GoPro or Sony when it comes to brand name, it is an emerging brand that is well-recognized for its quality yet affordable cameras. It is a subsidiary of Hikvision, a well-known manufacturer based in China. Hikvision is also the largest manufacturer of video surveillance products and solutions in the world. 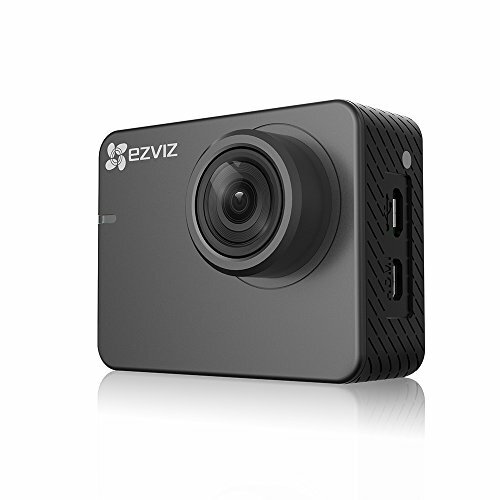 In here, we will talk about their latest model, the EZVIZ S2 Lite Full HD Sport Camera, which is also an upgrade to their previous popular model, the S1. The S2 Lite is designed for professionals and offers a wide range of features. It is a full HD sports camera with 1080p at 60fps, ensuring high-quality video output. This means the camera has an ability to capture 60 frames in a single second. The 8 MP camera also provides you with top quality still and moving images. The camera features ultra-wide view angle of 150 degrees too, which allows it to capture more of the action. The EZVIZ S2 Elite is an impressive upgrade of their previous model, S1. This multi-purpose camera comes with all the features of a great action camera. With some smart technologies used, it is a great option to use underwater, when driving, during water sports, in the night or low light, with amazing quality output. It is designed to provide you with excellent results in situations when other cameras fail, like at night. You can use the built-in WiFi option to connect it with the Android or iOS app, or you can use Bluetooth 4.0 to connect with your phone. Inside the package are the camera, battery, USB cable, lens cover, waterproof case, and a waterproof lens cover. This means that you get everything you need to get started in just one purchase. As mentioned above, there are hundreds of models and brands that are competing to meet the rising demand for action cameras. Another good option to compare the S2 Elite with is the Dragon Touch Vision 3 Action Camera. Here, it is clear to see that the first difference is the fact that Vision 3 is a 4K Ultra HD camera, while S2 Elite is not 4K, but a 1080p HD camera. This means that when it comes to higher quality 4K video, Vision 3 will produce better results. The Vision 3 also has a wider view-angle of 170 degrees compared to S2 Elite’s 150 degrees. On the other hand, the S2 Elite is a multi-purpose camera with low light mode, a feature absent in Vision 3. Both S2 Elite and Vision 3 comes with driving modes that allow you to use them with a motorcycle and in your car as a dashcam. While both the S2 Elite and Vision 3 are waterproof cameras, the former can withstand up to 40m underwater, but the latter can only last up to 30m. They both offer multiple connectivity options, like built-in Wi-Fi and easy-to-use Android and iOS apps. However, the Vision 3 allows you to connect with a wireless remote control wristband as well. The S3 Elite offers some other amazing features for better quality videos as well. These include distortion correction technology, 3um larger pixel sensor, and WDR (wide dynamic range). Overall, both cameras are good options. If you want 4K Ultra HD, you can buy Vision 3, but other than that, for a 1080p multi-purpose HD camera, S2 Elite is a clear winner. The S2 Elite is an excellent action camera from a well-known manufacturer and brand. It offers you great value for your money with all of its fancy features and smart tech. It can deliver the best quality video and images. As it is a multipurpose action camera, you can use it for anything you can think of, which makes it a very handy product. Overall, we can’t see any reason not to recommend this to our readers.